The inaugural trip in 2010 was the best INtuition trip of the year- and that's saying something as every INtuition trip is legendary! We totally scored it with wind everyday. The first week had flatter water so we were able to progress all our general skills before the surf hit and the INtuition gang all became wave sailors! The town is very interesting with 4000 residents and all the trimmings of an exclusive tourist destination but instead of tarmac, all the roads are made of white sand. As such the only cars you see are beach buggies, 4x4s or horses, making Jeri a world away from other windsurfing venues and well worth the journey. Our hotel was just incredible, the centre was superb and the conditions were bang on- Jeri is a dream destination for an INtuition course. Trade winds blow from the same direction daily, with plenty of wind all day every day! Combination of flat water, small chop and gentle waves. We basically have a private sailing area in Jeri, avoiding the incredibly crowded main peak we sail at the area locally known as 'Heaven' where most of the resident pro's sail. The waves are a bit smaller but winds are better and we have the venue to ourselves- a unique quality in the otherwise extremely crowded Jeri. Not a slither of neoprene in sight. 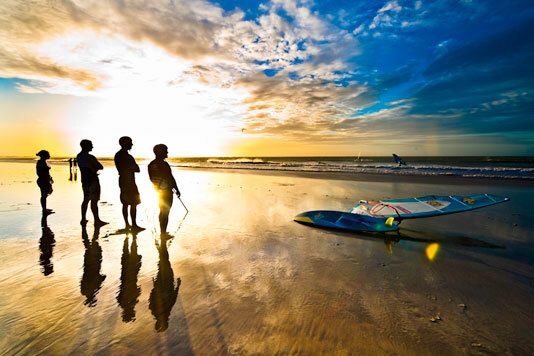 Tico Wind is a small rental centre that we have exclusively for the course. The staff and service are as good as you can get. JP and RRD boards, Neil Pryde and RRD rigs. THE very best hotel in Jeri, by far. Exclusively situated closest to the legendary sand dune, Villa Kalango is a unique property and one of the coolest hotels you're ever likely to experience. 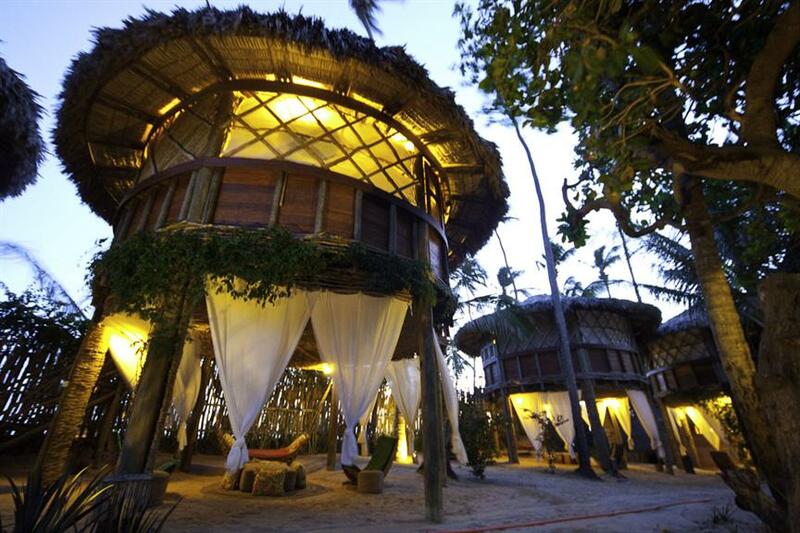 Tree houses meet luxury, only in Brazil, right on the beach with our private rental centre in the grounds. 4 hours by 4x4- or helicopter by request. Board shorts and sun cream by day, board shorts by night! Plenty of room and privacy for all the onshore coaching and muscle memory sessions- the perfect learning environment. The sea is about a 200 metre walk from the centre- but the centre staff carry all your gear for you. We actually windsurf a further few hundred metres downwind where we can walk back, sail back, or catch a beach buggy back from, but of course INtuition always provides ample water and refreshments on the beach wherever we're sailing. Jeri has shops, sand boarding, surfing, horse riding and plenty of other things that none of us had time for as it was windy every day! Jeri is extremely cool. If you want dinner party stories you'll find them here. A must visit on INtuition's world by storm. I film from the beach and catch everything! Great food. Brazilians know how to cook and we are seriously looked after by the restaurants we visit- as usual this is every night as a group social. Lunches are pre arranged everyday too, so it's straight off the water into a pasta meal or whatever you need to keep you going for the day- no waiting around with INtuition, your meal will be ready for you the moment you're out of your footstraps! It is not uncommon to find yourself drinking Caperinhas or other wonderful cocktails on top of a sand dune with the sun going down, or around the pool at the hotel immediately after windsurfing. As usual on INtuition trips our evenings consist of a delicious dinner prepared for the whole gang, washed down with good wine and plenty of conversation. Basically the world's best dinner parties- guests from all over the world hang out, eat well, drink a little, talk a lot, then crash out knackered after an amazing day windsurfing. There is night life in Jeri but you have to trash your next day to get to it as it doesn't start until after midnight, and although we managed it once, we're there to windsurf. You can do what you like of course.